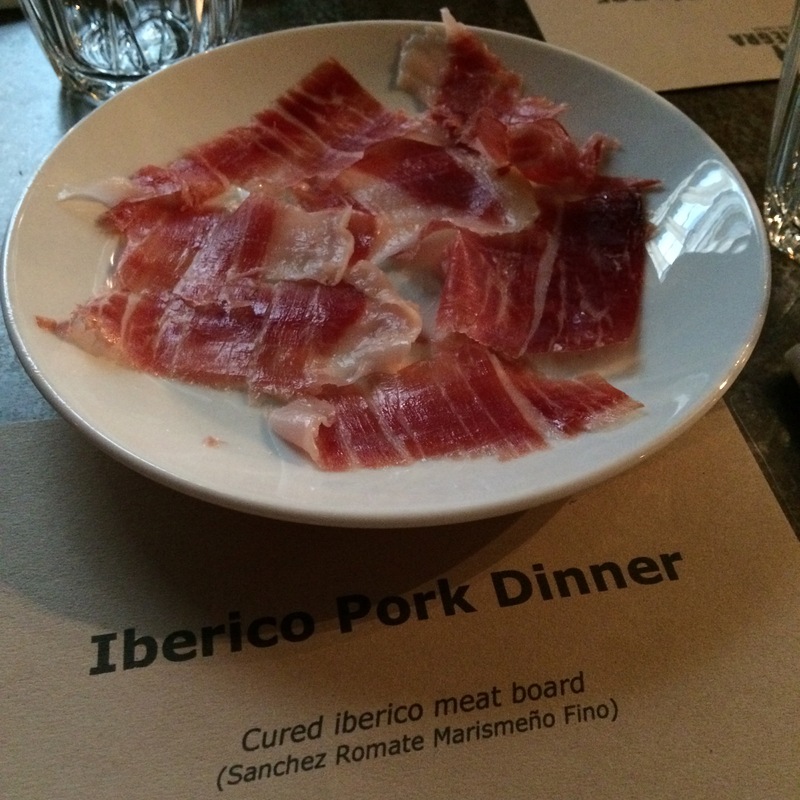 When a notification comes up on your facebook for a local restaurant is running a sherry and Iberico pork evening, you know that is only one option for me and that is gather meaty friends and book tickets. 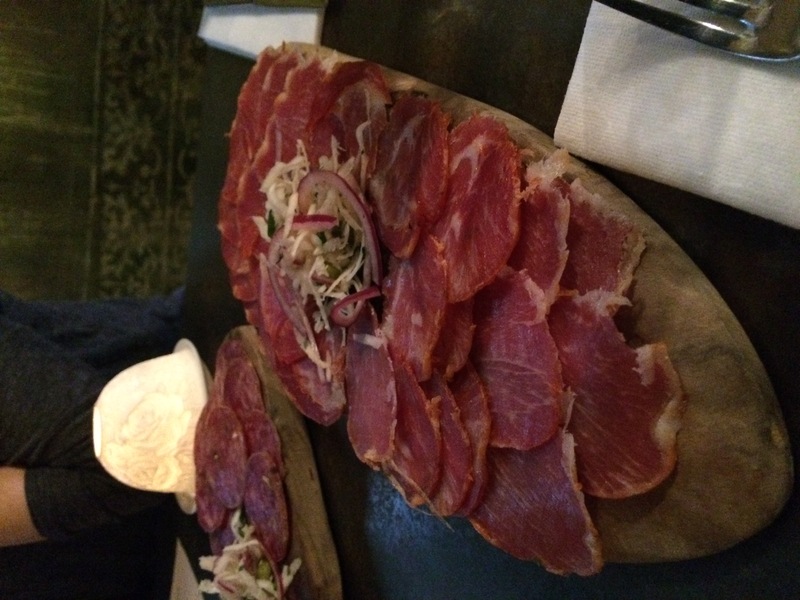 Pata Negra is still fairly new to Bristol and I just haven’t had a chance to head to this Spanish tapas restaurant but as they are part of the group that includes my favourite steak restaurant The Ox, I had high hopes and wasn’t disappointed. 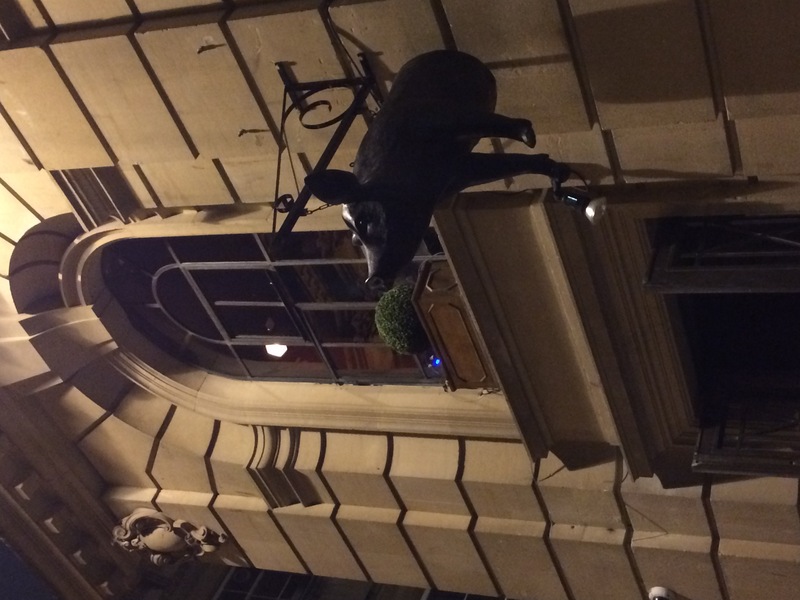 When this is the street sign that welcomes you, it’s not going to be a vegetarian meal…. 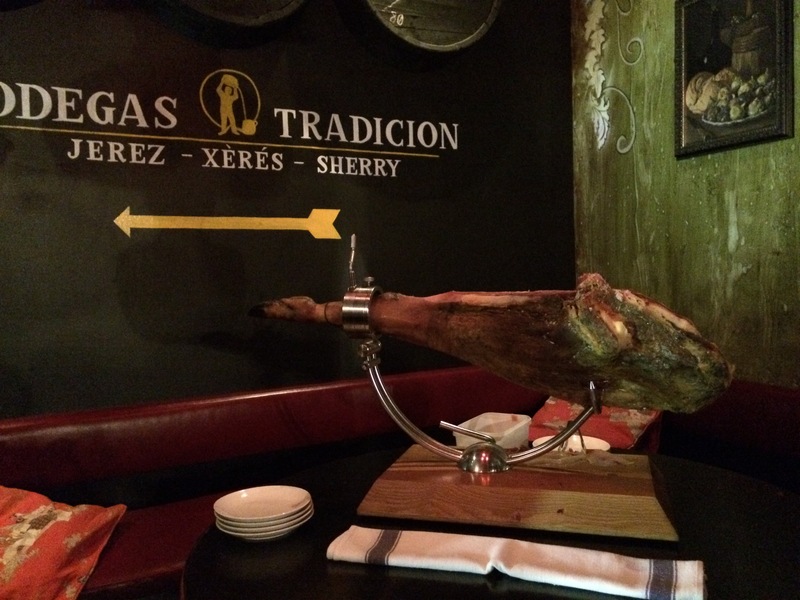 The first meaty treat was the 36 month hand carved Jamón ‘Pata Negra’. Fed on acorns, with the Pata Negra (Black Hoof) pigs laying down the fat as marbling than a thick surface layer like more English breeds, means that when craved to wafers the fat and flesh just melts on your tongue for an intense meat treat. 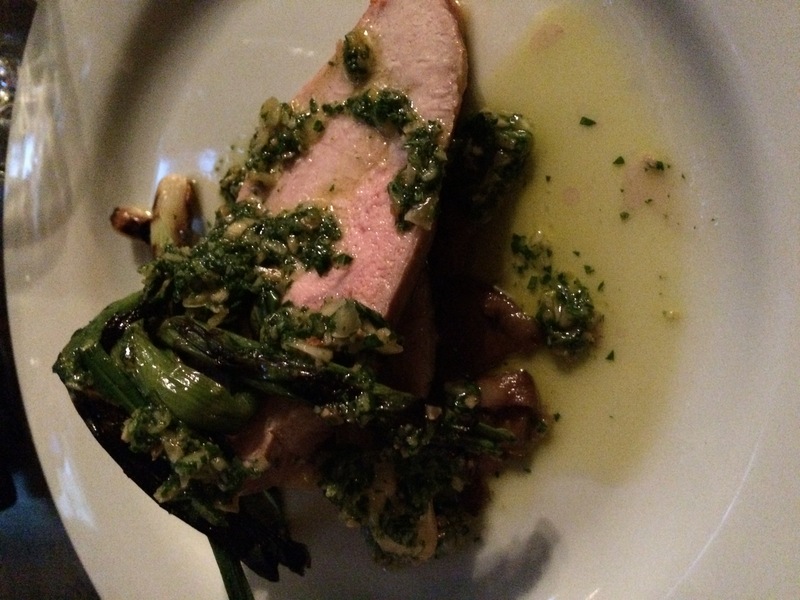 This was all polished off with a glass of crisp Fino sherry that helped cut through the richness of the pork. 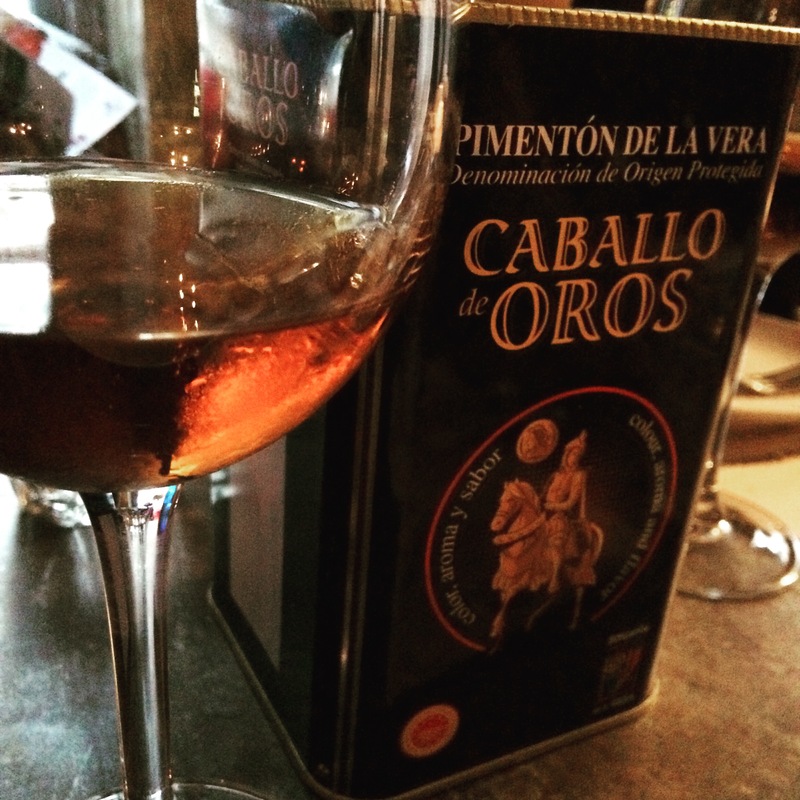 We moved on the richer Amontillado sherry which has a more raisin syrup flavour that also worked wonderfully with the mixed Iberico meat boards and stew. 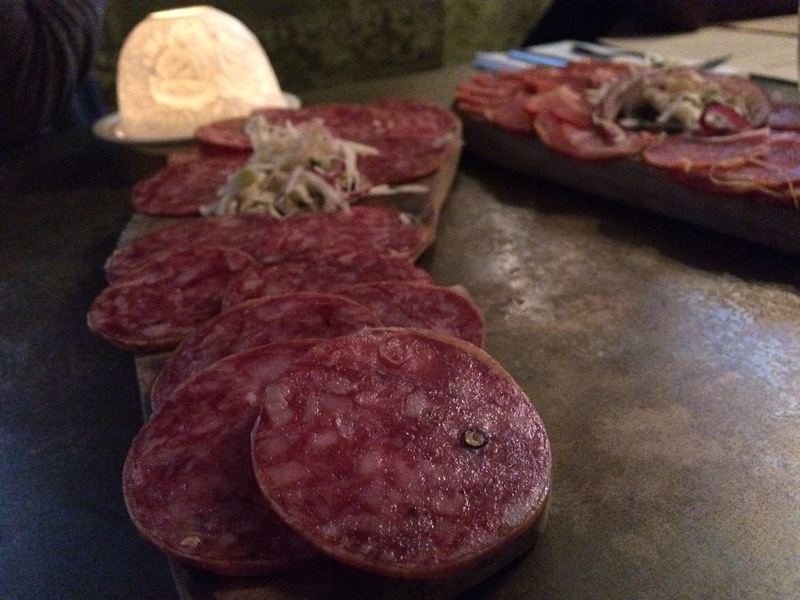 Slices of the fat marbled Salchichón Iberico, a deliciously fatty sausage with plenty of garlic and black pepper. With piles of celeriac salad and bread, we could keep our mitts of these bad boys. 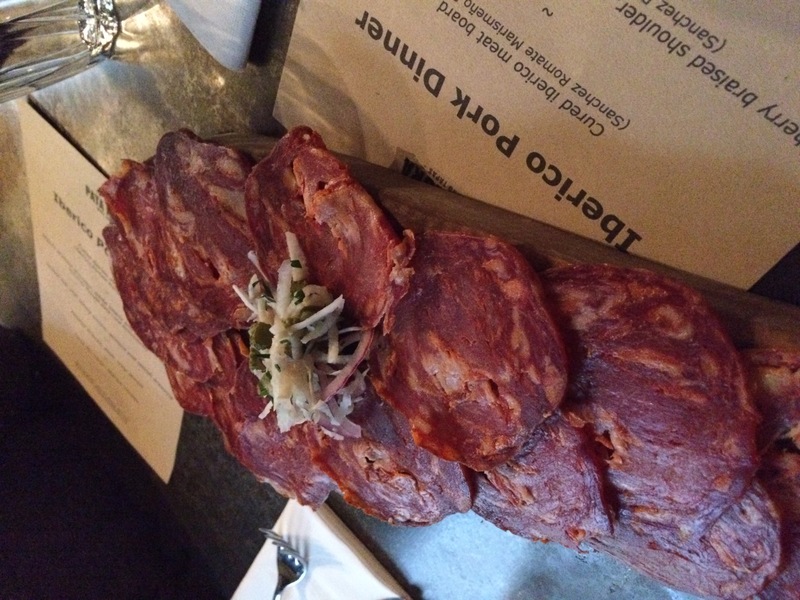 You can’t have an Iberico pork night without some chorizo made with this meaty gold and laced with plenty of paprika and garlic. Lomo Iberico was next on the platter, a cured loin of Iberico which was a lean cut but doesn’t miss anything without the amount of fat that the others have. A delicate but punchy addition to any meat board. The next course got me rather excited. It’s no secret to my friends and family that I adore a cheeky croquetas and could happily eat a whole plate of them in the sunshine to myself. 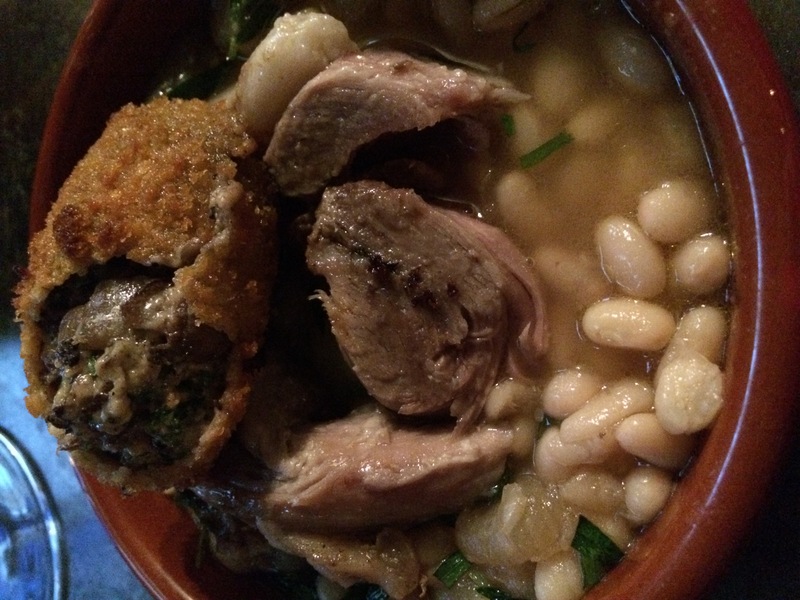 The next course was as great as it sounds – Sherry braised Iberico shoulder, white beans and morcilla croquetas. 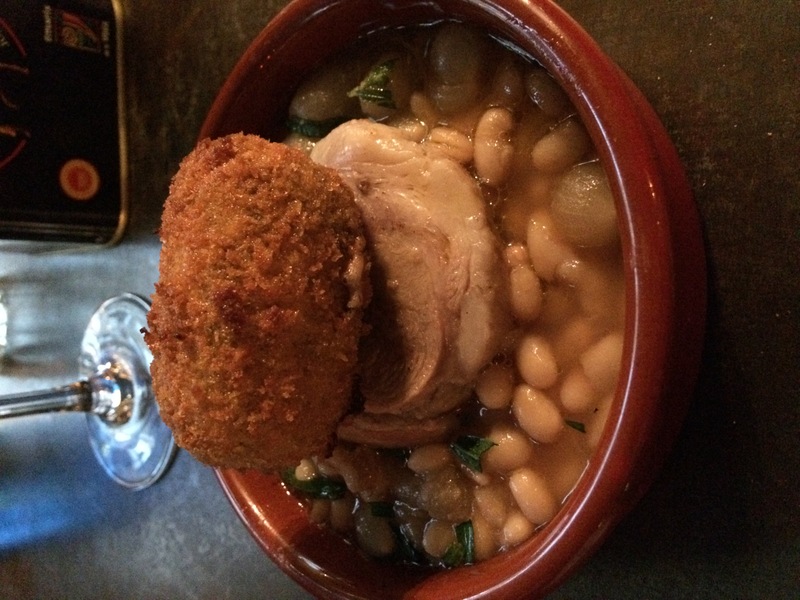 Braised in a whole lot of the beautiful Amontillado sherry we were sipping on with fresh tarragon, white beans and baby onions with a tender slab of Iberico pork. Balanced ontop was a crisp golden morcilla croquetas, a Spanish blood pudding which had a hefty about of black pepper but the creamy richness of the sausage made the dish and had the texture and slight flavour of a mushroom duxelles. More needed. Slowly filling up at this stage of the evening but managed to definitely find room for the next course of grilled loin with spring onions, almond and lemon dressing. Meaty oyster mushrooms pan fried under the almost milky tender loin. This plate just screams Spring and the freshness the new season ingredients brings to create such clean fresh plates of food. 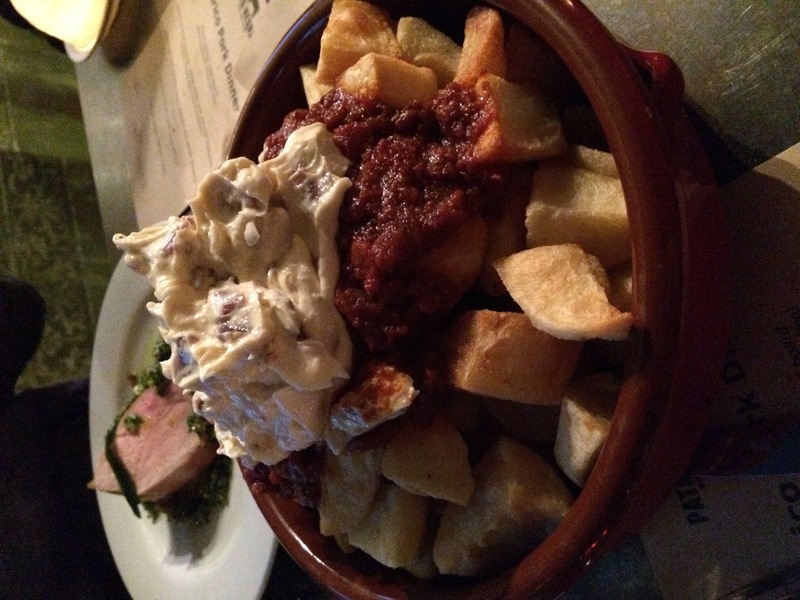 To go with the loin was probably the biggest bowl of Patas Bravas, alioli and crispy jambon you have ever seen. I didn’t think you could improve on the punchy alioli perfection but you know what added crispy jambon will definitely do that! No passionate kisses for us with the amount of garlic but it for sure left big grins on our faces. Super super full at this stage when it came to the final cheese course. In a cloud of cheese fumes the Torta del Casar and Iberico Croutes were presented to our tables. Aged for at least 60 days this cheese is a ripe beast, oozey and nutty and best spread on to the crisp toast. 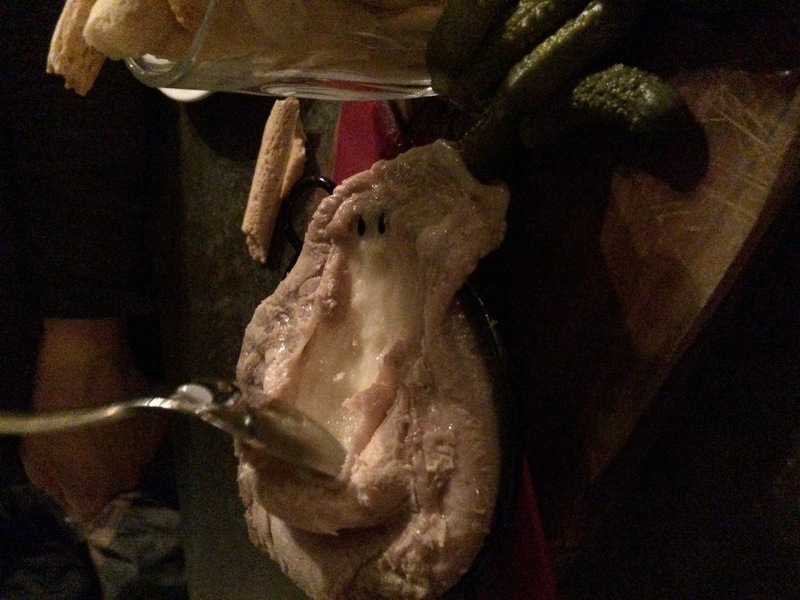 Or a cornichon dipped in. To be honest I wasn’t a big fan of this cheese but still a nice way to end a delicious meal and exploration in the world of Iberico pork and sherry. 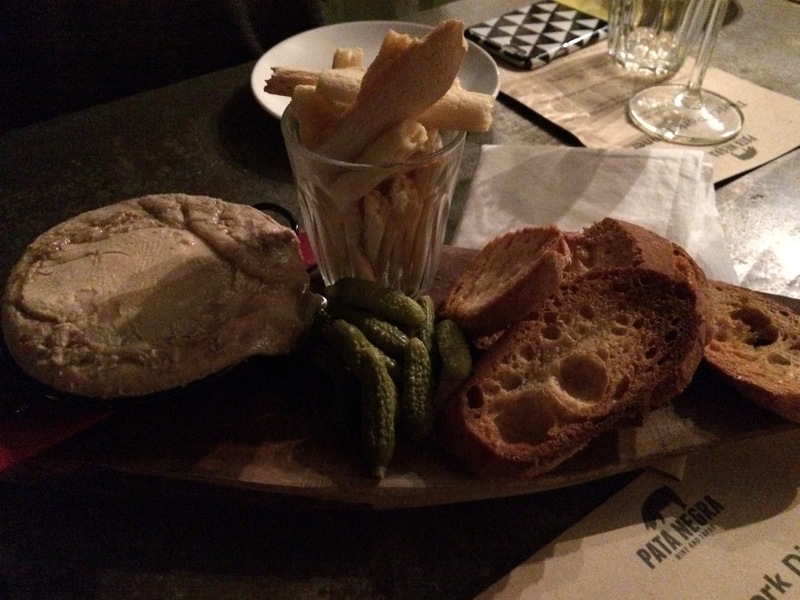 Had a wonderful evening and can’t wait to return soon to try out the rest of the menu and other Spanish delights.